Abbott Racing’s general manager, Giles Fairweather, has recently purchased a 9000 Aero for personal use. Outlined below is a Giles’s “conception-to-completion” diary explaining the various stages of repair / tuning undertaken by ourselves. Two years later and a 1-year-old Emerald green, 99L, 4 door arrived on the drive (all 2000cc of it, wow!!). The 99L served our family well until it’s sacrificially offering at 198’000miles as a trade-in for a 900GLS. Upon leaving school I served my apprenticeship at Cox of Ipswich from 1980 to 1985. There I remember seeing the newest and fastest Saabs arrive with excited anticipation; my first 99Turbo test drive, the Saab rally cars for a stop over, the first 900T16S and the 900 sedan – which was not quite so exciting! From Coxes I moved to Mazda, where I stayed for five years. It was during my time at Mazda I spotted a small ad in a local newspaper requesting applicants for the job of No. 2 race mechanic. Fancying a new challenge, I applied and was subsequently offered an interview. It was during my interview with Ed and Lionel Abbott that I learnt, to my amazement, it was for the works Saab racing team! working hours that were less than regular. I started on a Monday and by Wednesday I was on a ferry heading to the famous Nurburgring for a 500Km race. Lionel Abbott took myself and Neil Peck ( No 1 race mechanic) for a blast around the 14 mile circuit in a road going 9000 2.3 Carlsson as a means of “track familiarisation”. As Lionel expertly guided the Carlsson through very fast turns to even faster ones, I was convinced the tyres were going to come clean off the rims!! More than once it occurred to me that the German importer, who loaned us the car, was going to have to not only replace the tyres but also clear up my sick!! It took me three hours to find my land legs again. Along with Neil, and myself we also had additional help come race weekend in the form of Mat Gibbons, a technician from Saab Marlow. Mat had continued to help us out for about 4 years before getting a full time job within the motor sport industry and ended up going to work on touring cars, group C sports cars and F1. It is at one of these race weekends that Mat had arrived at the circuit in a new 9000 Aero (1993). We were at the time racing the very successful 9000 CS race car,(1) with it’s magnificent reliability we were able to find time to take a look at the Imola red Aero. Even then I knew it was going to be a winner, with it’s large wrap around seats and beautifully tailored body kit. We started to receive more and more requests, mainly from dealers, to tune the Aero. I can remember collecting brand new cars for allsorts of modification (and still do). During the production period of the 9000 Aero we did a lot of work for one Saab dealership in particular, Saab City in London. They would want us to supply two specs. of tuned Aero. The T9 and the T18. The T18 had every product available from us (at the time) fitted to the highest spec. 9000. These would be sold for anything up to £45’000 with amazing regularity. One tuning job in particular sticks in my mind. We did one for a Russian customer of ours, this been increased to 2500cc with 18” Speedline wheels, AP brakes, LSD (limited slip differential), big valve head, up-rated suspension, exhaust work, bigger turbo(2) etc. We sent this off Via Harwich and have never seen it at the workshop again but do, however, receive the occasional order for new discs and pads so I assume must still be happily delivering its very usable 330Bhp in Russia somewhere. Although I enjoy driving other Saab models the 9000Aero has always been the one for me. Some could say the last real Saab. This was confirmed one evening when I delivered a black Aero, a car which we had already done a substantial amount of tuning to and had now just had a LSD fitted, back to it’s owner, Chris McCought. We had planned to meet at J8 on the M25 where we would swap cars and go on our way. What a fantastic car to drive. It had everything, great power delivery, comfortable but controlled ride, precise steering and not to mention good looks. It was time to put my money where my mouth was! After two weeks of searching I found something worthy of a further look. 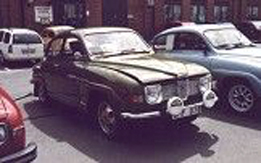 The Aero was in black with black interior and although my ideal choice would be Midnight blue with Dover grey, I knew that Saab had only made 1 in the model year I was after so felt it, to say the least, unreasonable to hold out for that 1 car! Upon initial inspection I ran through the usual checks such as H.P.I., service history, previous owners etc. and everything on paper looked good. But asides from the paper work I need to feel comfortable with the car. Paper work alone is not enough to buy a car. It’s also got to “feel right”. A sensation hard to quantify or even explain. The “feel right” sensation is attained after a good look around, in and under the car, a test drive and even who’s selling the car. I remember one occasion in particular where this sensation is highlighted. I saw advertised a classic 900 T16S convertible for sale with a mere 39’000 miles on the clock. These cars keep their value very well and a car of this spec. could be worth up to £10’000. This was advertised for £3’700 so demanded at least a further look. Immediately upon arrival I noticed that it didn’t have the right body kit, and upon further inspection, no electric seats and no A.C. The log book however stated it was a T16S. This car didn’t feel right so I walked away very soon after arriving. A car has to not only be of sound mechanical working order but also have the right level of history and of course the “feel-right” factor. All of which we exercise fully by ourselves here on a day to day basis for customers wishing to find the right car. I bought the car and took it home with me there and then feeling excited and content that what I had purchased was a good, sound 9000 Aero. Even a car with relatively few miles such as this will still manage to pick up signs of its previous usage. A few areas in particular had caught my eye. There was a small dent near the fuel filler cap that needed repairing and also the top of the rear bumper where the previous owner had slid items into the boot and scuffed the paintwork. Also, I felt that to really make it shine like new, if not better, I ought to get the car mopped. For those of you who don’t already know, this process is done using a large soft spongy, woolly material attached to a slow speed device resembling an angle grinder. The mop head is impregnated with a course compound that will remove any relatively deep blemishes within the paint. Then a less aggressive substance is used to bring back a shine and finally a high-grade wax to give further depth to the finish. So it was off to the body shop to get this sorted. Arrival at the body shop, mopping process and dent near fuel filler cap mid-repair. A Rolls Royce shown at various stages having a full body overhaul at the body shop. With the car back from the body shop it was now time to fine-tune the appearance even further starting with the removal of any other smaller dents that didn’t require filling. Any dents or dings, which are in the bodywork that have not split the paint or stretched the metal, can be very successfully removed without the lengthy process of filling and repainting. In my case we only had two very small dings to remove. The next area to perfect was the interior. I had noticed three areas that could do with improving. The rear left leather door trim had been scuffed so had also a small patch at the top of one of the rear seats. The third point of repair was the leather steering wheel. The steering wheel had lost a lot of its original feel and become almost sticky. All three areas have been successfully treated / repaired to the point of looking as good as new. Leather steering wheel repair, door trim repair and small dents being removed. Content with the interior repairs I moved onto the more mundane details such as replacing a seat heater switch bulb, dash rheostat bulb, and N.S.R. window switch and then clean and feed the seats. Despite the Aero having a service not so long ago by its previous owner I decided to start from fresh and give it a full service and a new M.O.T. anyway. Feeling happy with the Aero’s condition I felt it required a little “extra”. Even though I’m not interested in increasing the top speed of the car (which is already 140MPH +) or, come to think of it, ¼ mile drag strip runs, the added driveability and pleasure that is derived from an increase in power and torque made certain mods. a must. I started with upgrading the E.C.U. This alone provided a further 40 Bhp. Most of which is felt further down the rev range so therefore the gains are very apparent when driving an auto. as there is no need to kick down to a lower gear, making for a very smooth and flowing power delivery. Next was the exhaust system. I left the front pipe std. but changed from there back (flexi link pipe, centre section and back box). Although the catalytic converter was retained a significant gain can be felt, whilst also not making for an obtrusive, loud exhaust note. To compliment the free flowing exhaust system a slight change was done to the intake system in the form of an I.T.G. air filter and motor sport dump valve. The power increase from the E.C.U. upgrade is continued further up the rev range and broadens the power band. Content with increased power I now wanted to improve the chassis. The Saab 9000 Aero is a heavy, powerful car that requires some help when changing direction so I fitted polyurethane bushes and springs. The polyurethane bushes replace the std. rubber items which, even when new, have a lot of “squish”, let alone when they’re older. The wishbone bushes help control the front bottom wishbone pivot and minimises the amount of wheel deflection under heavy braking and accelerating, providing excellent stability. The anti roll bar bushes aid the operation of the anti roll bars themselves so therefore enhance the std. package releasing their potential to a maximum. The result being a more positive feel to the car in cornering and braking / accelerating. The Abbott Racing springs not only lower the car by about 15mm but are also of a stiffer spring rate. This means that the car will lean over less and become much more responsive. I’m always impressed at how much these mods. Improve a car and at the same time not reduce the comfort. Although the standard 16” wheels and tyres offer a respectable package this can be greatly enhanced. My wheel and tyre choice is the 18” Kahn fitted with a Michelin Pilot Sport tyre. A good wheel and tyre choice can improve a cars handling tremendously but if the wrong wheel off set, low quality tyre or a wheel that is too heavy is used, a car can be completely ruined. We have learnt from our racing days the precise dimensions to deliver an outstanding package. With the extra power supplied from the engine mods. and large wheels exposing the brakes, I opted to fit the motor sport discs and pads. Although the motor sport pads will physically fit the standard discs, the increased braking performance is improved further still as a disc and pad combo. The brakes on a powerful, heavy road car probably have the worst life of all brakes, with no benefits of large air ducts, and reduced weight like that of a race car. I always recommend this upgrade when more power has been extracted from any car. 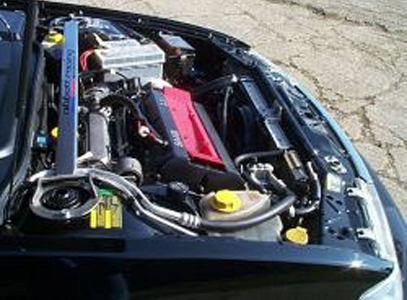 The very last item to add is a front strut brace. Now the Aero has had its increased power and improved suspension mods, I now feel that the font strut brace will come into it’s own. The strut brace increases the front-end rigidity and then in turn provides further suspension control, not to mention looks fantastic under the bonnet! Now I am very happy with my Aero. It was a fine car when I bought it and now it’s a fantastic car. Very swift, smooth power delivery and excellent handling whilst retaining the ride and comfort you’d expect from a Saab, complimented with it’s good looks makes for a very rewarding car to not only drive but own. With spring and summer gone (which went very fast, almost as if it hadn’t happened…) I felt it was time to do some more tuning to my 9000 Aero. Although I felt as though there were no “holes” which needed filing I still felt as an overall package there was room for “more”.. So I opted for the 9000 induction kit – to further improve air flow capacity which in turn has the effect of improving performance throughout the rev range, in particular the higher end. And the 9000 rear anti-roll bar – a “bolt-on” product which stiffens the rear of the car in a rolling moment. One of the benefits of increased anti-roll bar stiffness is it will decrease the amount of body roll whilst cornering but will not detract from the ride of the car. Wishing to have the best of everything I opted for the carbon fibre induction kit. These are new to our tuning range and not only offer a weight reduction but also look absolutely fantastic! Looks may not make a car go faster but they still count! A kind word with Peter in the workshop and an hour later the induction kit was fitted. I can really feel the engine “breath” better, truly releasing more of the engines potential. As the revs increase so too does my smile. Another kind word with Peter and only half an hour later, the rear anti-roll bar was also fitted. Now entering a fast corner I can turn in with increased confidence knowing that the back of the car feels a lot more stable with no unexpected rear-steer affect associated with more body roll. One of the great advantages of this product is that instead of replacing the standard item for a bigger one, i.e. removing the original, you only have to attach it to the existing item. Many years of experience has shown that removing the rear dampers and anti-roll bar can add up to 3 hours to a job due to seized bolts. Not good! Yet again, I’m very happy with my 9000.